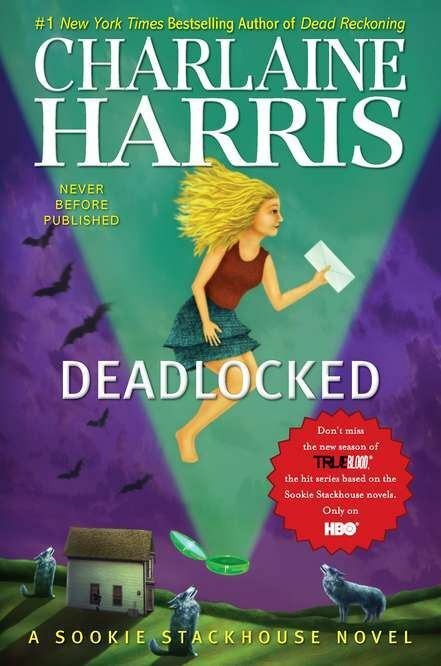 As the 12th and penultimate book in its series, Deadlocked had a pretty hefty role to fill: beginning to tie up all the loose ends in Sookie's story and give everyone a bit of closure. It isn't easy, and of course it won't please everyone, but all good things must come to an end, right? Deadlocked takes place over just a few days in which Sookie attempts to resolve her romantic issues with Eric, but instead gets caught up in yet another elaborate plot that put her life in danger. Nothing new for Sookie, right? In what felt more like weeks than days, some very important pieces of her seemingly stable life come crashing down. The pacing in Deadlocked is slow, but deliberate. The story escalates to the point that I was two chapters away from the end and wondering when the big fight will be, who Sookie needs to accidentally kill or who will try and kill her next. The lack of action throughout the book creates this tense atmosphere for the reader that has one feeling the same intense dread Sookie does when the warning bells start ringing. Oddly enough, Deadlocked has the warm, fuzzy sort of ending that almost made me feel like I didn't need to read anything else afterward to complete the story, even though the original predicament of the novel remained unresolved. It left me wondering, "Is it really that important whether Eric is faithful and loyal to Sookie?" The biggest burden on her during the novel turned out to be the cluviel dor, not him (or any other man). Honestly, after some thinking, I don't know whether it would be a happy or even reasonable ending for Sookie to stick it out with Eric, if only because she has no plans to become a vampire and in the end, she would grow old as vampires stayed the same. What's more, and this was a big theme throughout this book that was introduced in the previous title, Eric would never be able to make her (or help her become) a mother. No happy families or afternoon picnics in the sunlight for them. I'm not too sure what to expect with the last book. I believe that Sookie will always lead an interesting life as a known telepath, friend to (some) vampires, Friend of the Pack and any other supes, etc. But I don't think that'll be a part of her romantic life. At last, not the vampires, werewolves or werepanthers. The best romantic prospect (in my eyes) is her loyal friend Sam, and even that seems like a bad idea. I can't guess what will happen next, but like I mentioned earlier, it sure is going to be interesting. I'm definitely looking forward to next year's release and the conclusion to the Sookie Stackhouse novels.